Cool! Let's begin by adding a large square to represent the head of this cartoon character. 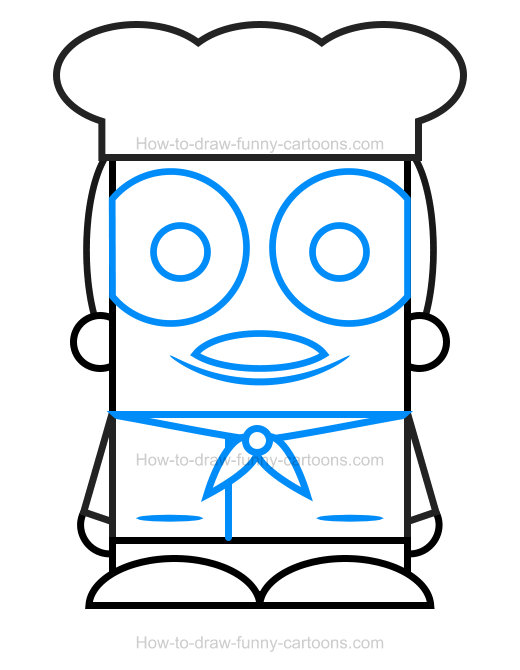 Next, create a small rectangle below the head to form the body of the chef. Finally, draw one additional rectangle to illustrate the legs. Once you are finished, you can draw some feet using small oval shapes. On both sides of the head, draw two small circles to form the ears. The hair is done using long curved lines. On top of the head, draw a hat using a few curved lines as shown in the illustration below. Near the body, you can sketch arms using rectangles and hands using small circular shapes to complete this important step. We are almost done (yes! already!). Inside the square used to form the head, draw two large circles to create the eyes. Smaller circles are used to represent the pupils. The mouth is done using a long curved line with pointed ends. 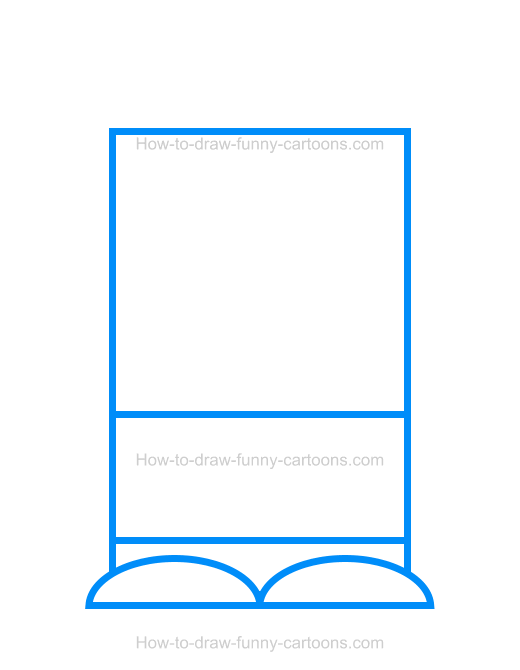 Draw a mustache using an oval shapes with narrow ends. Some lines can be drawn on the shirt of the character and a scarf made from straight lines is added below the head. It's time to add some colors! 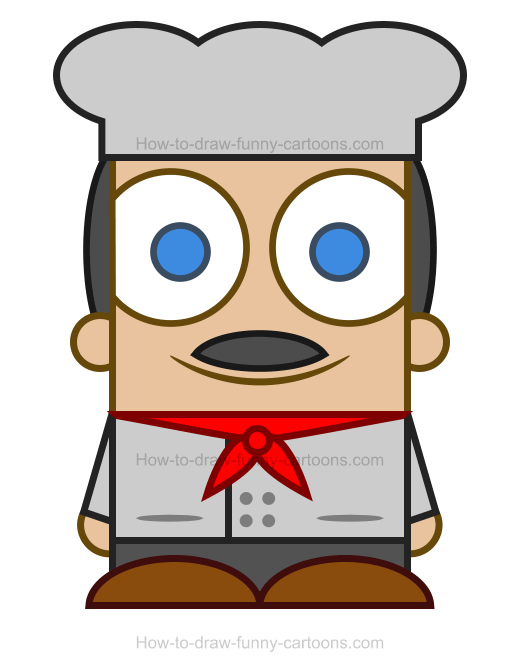 Of course, you can select a basic skin color inside the head, the ears and the hands of the chef clipart. The hair, the pants and the mustache are filled with a dark grey color. The hat and the shirt are filled with a light grey color. The scarf can be red while the feet are brown. A bright blue color is used inside the pupils of the cartoon character. 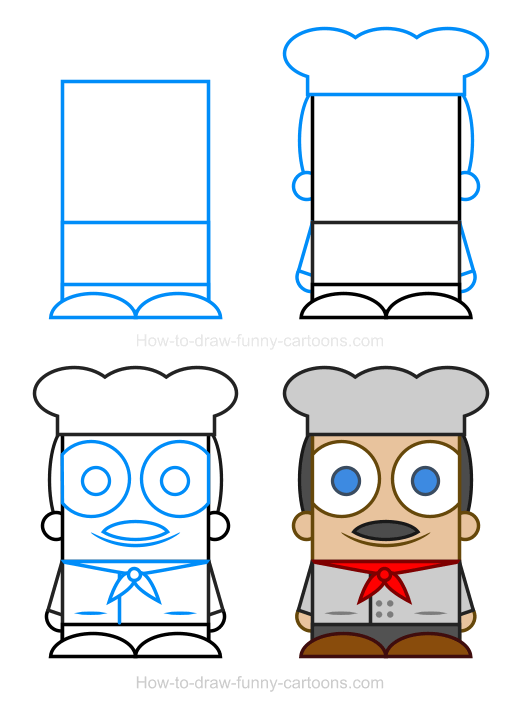 Nice work illustrating this fun chef clipart! Excellent work! 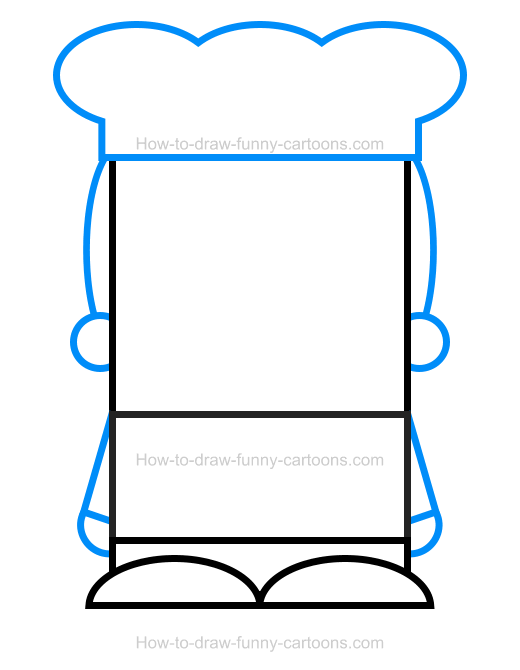 I hope you had fun illustrating this cartoon character using simple basic shapes. You can also try more similar characters if you want to improve even more your drawing abilities. You can start with a simple version made from several rectangles. You can also try another chef, but this time made mostly from circles.